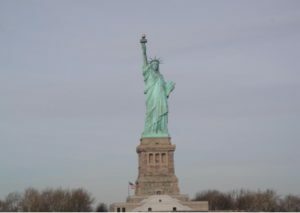 Highlights: Visit New York (Empire State Building, Fifth Avenue, Intrepid Sea, Air, and Space Museum, One World Trade Center, Rockefeller Center, The Metropolitan Museum of Art, Times Square, United Nations, Wall Street). Passengers will be picked up in Queens and on Bowery Street in Manhattan in the morning. Today we will embark on a tour of New York City. Our first stop will be the World Trade Center, where we can catch a glimpse of the under-construction memorial. From there, we will visit Wall Street and take a Cruise of New York Harbor. 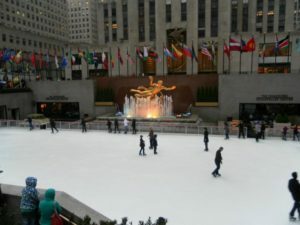 After, we will pass by Rockefeller Center, Fifth Avenue, and stop at the world-famous Empire State Building. Our day concludes with visits to Times Square, Madame Tussauds Wax Museum, the Metropolitan Museum of Art, and the USS Intrepid. Passing By Rockefeller Center (Passing By) A member of the U.S. National Register of Historic Places as well as a National Landmark, the world-famous Rockefeller Center (named for John. D. Rockefeller’s son) in Midtown Manhattan has been a New York hub since the 1930s. Always Visit One World Trade Center One World Trade Center is the main building of the new World Trade Center complex in New York City. Once completed in late 2013, this will be both the tallest building in New York and third-tallest in the world. 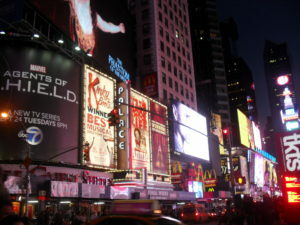 Always Visit Times Square Called “The Crossroads of the World,” this major intersection in midtown Manhattan– where Broadway hits Seventh Avenue– is a world-famous icon of both New York City and the United States. It has appeared in countless forms of media. Always Visit Wall Street This famous street in New York City’s Financial District has become synonymous with American financial enterprises. It is also the home of the New York Stock Exchange, and has been (or still is) the location of several other exchanges. Always Visit The Metropolitan Museum of Art The Metropolitan Museum of Art is not just the largest art museum in the United States, but also one of the three biggest in the world. Its collection contains more than 2 million works of art. Admission (Optional): Adult $25; Child (Under 11 yrs) Free; Senior (Over 62 yrs) $17|Opening Hours: Fri – Sat 10:00am – 9:00pm, Sun – Thu 10:00am – 5:30pm, Closed on Thanksgiving Day, December 25, and January 1|Duration: Approx. 1 Hour 30 Minutes Always Visit Statue of Liberty Cruise This boat ride through New York Harbor loops its way around Ellis Island, home of the Statue of Liberty. Ellis Island was the arrival point for immigrants to the East Coast of the US for decades. Admission (Optional): Adult $29; Child (3-12 yrs) $17; Senior (Over 62 yrs) $24|Duration: Approx. 1 Hour 30 Minutes Passing By United Nations (Passing By) This building in New York City has served as the global headquarters of the United Nations since 1952. The area has extraterritoriality status, meaning it is technically not bound by the laws of New York or even the United States. Always Visit Madame Tussauds Wax Museum Madame Tussaud’s Wax Museum is a favorite attraction of people all over the world. Uncannily lifelike wax sculptures of figures both modern and historic decorate the halls of this museum, which dates back to London and 1836. Admission (Optional): Adult $25; Child (3-12 yrs) $23; Senior (Over 62 yrs) $25|Opening Hours: Mon – Sun May 23 – Sep 6 9:00am – 10:00pm, Sep 7 9:00am – 8:00pm, Dec 31 9:00am – 3:00pm, Sun – Thu Sep 8 – Dec 17 10:00am – 8:00pm, Fri – Sat Sep 11 – Dec 19 10:00am – 10:00pm|Duration: Approx. 1 Hour 30 Minutes Passing By Fifth Avenue (Passing By) One of the most famous shopping areas in the world– and one of the most expensive– New York City’s Fifth Avenue cuts across Manhattan and hold some of its most famous landmarks and event centers.